A UNITED STATES ARMY AIR CORPS MACHINE in flight above Mount Rainier, in the Cascade Mountains. This type of machine, the Boeing YB-17, has been popularly termed The Flying Fortress. It is a four-engined bomber, and the engines are 1,000 horse-power Wright Cyclones. The normal crew is seven to nine, and five machine-gun positions are provided. The span is 105 feet. Air liners regularly cross the Cascade Mountains on routes to and from the Pacific Coast of the United States. AERIAL mountaineering for survey purposes includes photography, mapping and flights to determine the best routes for air transport to follow. 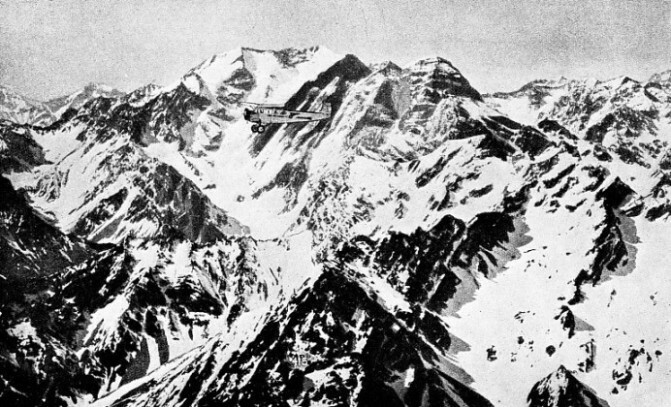 The earliest flights across mountain ranges were all by their nature survey flights. Much of this work has meant laborious accomplishment far from the haunts of men. Therefore, while record-breaking flights and pilots became household words, few of the mountaineering air pioneers were equally known. (Spitsbergen) - in 1923 - and the crater of the African mountain Kilimanjaro in 1930. In the south of South America the German, Pluschow, gave two years of hard work and finally his life to the first air survey of the wild mountains of Tierra del Fuego. In 1929 the American, Byrd, with three companions, first crossed the great barrier of Antarctica to reach the South Pole by air. British aviators flew over Mount Everest in 1933 (see the chapter “Over Everest by Air” on pages 73-83). Photographs taken on some of these expeditions have captured the spirit of the strange world of mountains that is visible from the aeroplane and have enriched the folios of photographic art. But more than this has been accomplished by such work. Frequently the air pioneers have obtained cartographic detail that was impossible or extremely hard to obtain by other means. To achieve success, special problems of flight have had to be met and solved. With the advance in mapping and in the art and practice of aviation, mountain travel by air has been made more secure for pilots and passengers. Some of the commercial airways of the world now traverse great mountain ranges in the course of scheduled passenger flights. The Rocky Mountains do not bar the passage of the aeroplanes that span the wide tract of land between the Atlantic and Pacific coasts of North America. In the southern hemisphere aeroplanes traverse the loftier Andes, separating the Argentine and Chile. Although Chavez, the first transalpine pilot, numbed by the cold, misjudged his landing, crashed and was killed, the Alps now present no obstacle to the passage of modern air liners. Today German and Italian air liners on the Berlin-Home air route cross the Brenner Pass all the year round. The passenger cabin is heated to between 60° and 70° Fahr; below, amid the snow and glaciers of the higher Alps there may be nearly as many degrees of frost. Across the German State of Austria air lines zigzag from Vienna to Venice via Gratz and Salzburg. 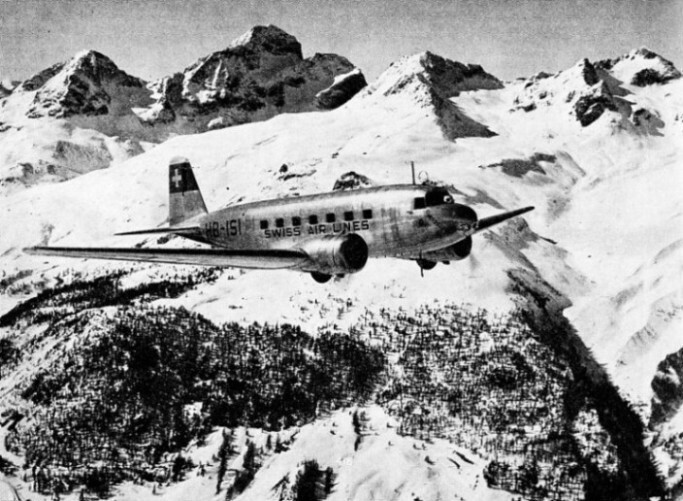 Swiss air lines navigate the Alps. Early in 1938 Samaden Aerodrome was opened near St. Moritz at a height of 6,000 feet. Air France runs a regular service between Lyons and Geneva. Although flying is the easiest way of passing over mountains, air mountaineering is not as simple as flying over level country. Mountain weather changes can be complex and sudden. High-velocity winds are often found at considerable heights and, when deflected by the mountains, can cause updraughts and downdraughts which sometimes place great strains on the aeroplane’s structure, as they produce swift changes in its elevation. It is unpleasant to be forced earthwards by a down-current into a wild canyon against the full power of the engine. So mountaineering by air demands robust aeroplanes, ample engine power and experienced pilots. Mountains impose special problems in navigation. Short-wave radio beams may be reflected where they meet the different twists and turns of the hills. A pilot trying to navigate blind along a valley by short-wave radio would find himself led, not to safety, but to a crash at some point where the wave was reflected from the mountainside. The technique of mountain flying differs from that of flying over relatively level country or over sea. More than in any other branch of flight today, in mountain flying the skill and knowledge of the pilot are the surest guarantors of safety. In the narrow and winding St. Moritz valley visibility is still essential for taking off or landing. In the wider valley of Geneva, with the long, level and relatively straight stretch of the Lake of Geneva, it is safe to take off into fog with ordinary blind flying instruments; but it is still impossible to land blind. There are two main objects in transport flying over mountain country. One is to connect towns situated among the mountains with towns upon the plains; the other is the direct traverse of the divide to link up towns lying on the plains or plateaux on either side of the mountain barrier. The first type of flying applies in Switzerland, where the mountain valleys are well populated; in Colombia, South America, where the capital, Bogota, stands at a height of 8,000 feet, far from the coast; and in New Guinea, where the coastal region and the gold mines are separated by mountains (see the chapter on “New Guinea Gold” on pages 287-291). The second type of flying applies to the air lines that cross the Rocky Mountains in North America and the Andes in South America. Terrestrial mountain transport is at all times forced to follow devious routes along mountain valleys and over the passes that offer the least resistance. The aeroplane, too, when weather conditions make it necessary, may be forced to follow similar routes, thus adding considerably to the mileage flown. But even then the superior speed of climb and manoeuvre of the aeroplane enable it to cover the distance in far less time than any ground vehicle. In clear weather the time saving of air transport is still more marked, for then the aeroplane can climb over the mountain tops and fly straight towards its objective. The railway journey of 130 miles between Zurich and St. Moritz, in Switzerland, takes about five hours. In winter, because of the treacherous state of the snowbound roads over the passes, a motor car takes still longer. By air the journey can be made with ease in forty minutes. THE EDSEL FORD RANGE OF MOUNTAINS near Little America, in Antarctica. This photograph was taken during one of Admiral Byrd’s reconnaissance flights north and east of Little America. 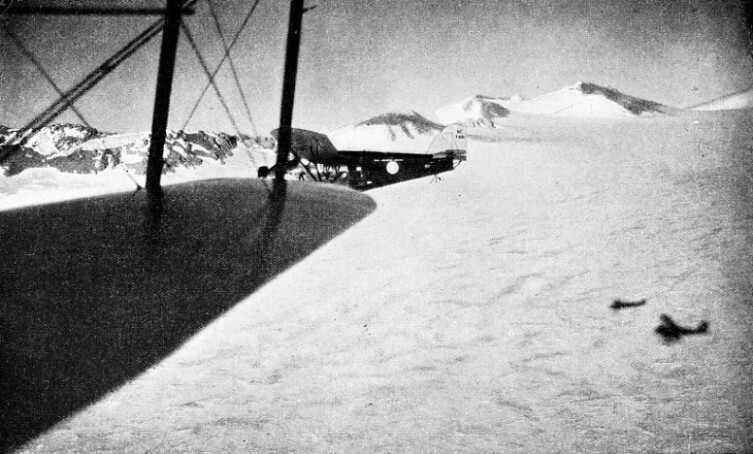 Byrd was the first to cross the great barrier of Antarctica by air, when he flew to the South Pole, This he achieved with three companions in 1929. When the mountaineering aeroplane competes with water transport, the saving of time is still more marked. From the Colombian port of Barranquilla, the surface journey to Bogota means an up-river passage by steamer through tropical and fever-stricken territory. When the river ceases to be navigable a comparatively short distance from the capital, passengers disembark and entrain. The railway takes them over a slow and winding route as it climbs some 6,000 feet to the city. This journey from the coast cannot be run to schedule. It may occupy from ten days to three weeks, according to the state of the river, which varies seasonally. The regular air journey from coast to capital is carried out in two and a quarter hours. The trans-mountain air routes also save time. The distance from Mendoza in the Argentine to Santiago in Chile is 120 miles in a straight line. Between the two cities stands the huge barrier of the Andes. Almost on the line, one of the highest peaks in the western hemisphere, Aconcagua, rises to 23,097 feet; some way farther south is Tupungato (22,329 feet). Between these two monsters of the Andean range winds the Uspallata Pass. Through the pass runs the Transandine Railway from Mendoza to Los Andes. This rack-and-pinion line tunnels into the mountain at a height of 10,500 feet. There is a road (virtually impassable in winter) as well. It almost touches 13,000 feet. The railway journey from Mendoza to Santiago normally takes twenty-four and a half hours, but the service was partly suspended in 1934 because of floods. The aeroplane does the journey in about an hour and a half. With sufficient engine power and oxygen equipment it is possible to make the aerial crossing in almost any weather, for the aeroplane can climb above the highest peaks and clouds. It is a marvellous sensation to fly above the Andean mountains at this point. Mendoza lies 2,470 feet above the sea. Thence the range rises gradually to 10,000 feet, then on to 15,000. At 15,000 feet the aeroplane flies roughly level with the mountain mass. Above this height rise peak after peak, looking as though the mountains had only just begun to raise their heads. The range is crowned with the sheer beauty of Aconcagua outlined against the pale blue of the sky. Yet, from the aerodrome at Santiago, 2,000 feet above the sea, Aconcagua is hidden behind the nearer mountains that rise abruptly from the plain. The weather is not always clear. Transandine air transport has encountered many difficulties with air currents. The main slope on the Chilean side falls sheer for some 14,000 feet. Westerly winds from the Pacific blow against this slope and are deflected upwards into strong, nearly vertical currents. On one occasion a passenger aeroplane flying at 17,000 feet struck one of these currents and was borne up with great rapidity to 24,000 feet. Passengers in the cabin were overcome for lack of oxygen, but the pilot succeeded in diving the aeroplane down to lower levels before anyone was seriously affected. For some time after that experience the passenger service was discontinued, and only mails and officials were sent across by air. Then a mail aeroplane, with all the characteristics of a high-powered military aeroplane, was put into service. Fitted with a highly supercharged engine, it had a ceiling of about 30,000 feet. In any weather, the pilot could climb straight up off the aerodrome on either side of the mountain range, to a height far above that of the highest peak. With his oxygen equipment he could fly safely and comfortably over the mountain mass, even when it was shrouded in fog, and land at the aerodrome on the other side. MAIL AEROPLANE FLYING THROUGH THE USPALLATA PASS in the Andes between Argentina and Chile. This picture was taken at an altitude of 17,000 feet from another aeroplane flying in the opposite direction. The impressive size of the mountains in this range can be appreciated from the fact that this picture does not show the side of a mountain, but merely the wall of a canyon. Some years ago one of the French airline pilots, Guillemet, flying the French air mail service aeroplane solo across the Andes, was forced to land. He was crossing the slightly lower Maipu Pass, 100 miles south of the Uspallata Pass, when he was caught in falling air currents in the heart of a snowstorm. He was forced into the basin of a lake. There he cruised round unable to climb out of the basin, until he was forced to come down near the snow-covered frozen shore of the lake, where his aeroplane turned upside down. Guillemet was unhurt, but he was alone in the mountains at a height of some 10,000 feet. After four days of trudging through wild ravines, he came to a shepherd’s hut, and so escaped almost certain death from exposure. Today, modern air liners pass above the Andes with regularity and ease, and there is no better means of appreciating the grandeur and beauty of the Andean scenery than by flying above the mountains. Three hundred miles to the south of the Uspallata Pass the range is wider, although the main mountain mass does not extend so far up towards the sky. Few have crossed the Andes at that point, and there is a wild beauty in the desolate range of rolling mountain, great gullies and series of wave-like folds of rock that reach a main level of 14,000 feet. Above that height rises, here and there, the peak of a volcano, with smoke blowing from its inner cone and sullying the pure white of the snow and ice round its rim. Wild as the Alps appear to be from the air, there is in the spreading of the Alpine landscape a sense of civilization; for in all the little valleys and beside the spreading lakes, little villages, towns and even cities spring up, weaving the pattern of the handiwork of Man wherever Nature has made it possible for Man to live. For those who have no other chance of mountaineering from the air, there are, in the airways that pass over the Alps, many opportunities of delighting in the beauties of a mountain landscape. Imagine a perfect Swiss winter day with the hot sun beating down through the crystal-clear air upon the snow and glacier-clad hills, and an aeroplane bearing the passenger swiftly above the Alps and sweeping down towards the hills above Davos. On the pure white cloak of the mountains below the little black figure of a man on skis goes flashing down the hillside at sixty-five miles an hour. Those who in youth have found joy in climbing rock slopes or traversing glaciers, can, in later years, when it is not so easy for them to mountaineer by hand and foot with rope and axe, keep up their sport in a new and different way. From the air they may see not only the view from the peak on whose summit they perhaps stood many years before; they can see also that very peak included in the scene on which they gaze. Still greater vistas of mountain scenery than they have ever known can now be theirs. Certain it is that mountain flying, whether it be over Tierra del Fuego, Svalbard, the Andes or the Swiss Alps, can arouse in the spectator from the air a delight which is unrivalled by any other kind of exploratory travel; for mountain scenery more than any other suits the three-dimensional flight of aeroplanes. 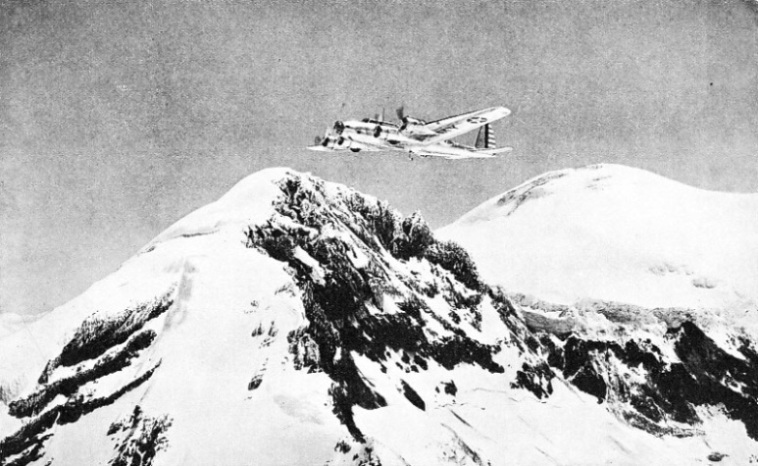 A SWISSAIR MACHINE FLYING NEAR ST. MORITZ AERODROME. This aerodrome, among the mountains of eastern Switzerland, is situated in a valley 6,000 feet above sea level. Surface transport between the Swiss towns of Zurich and St. Moritz takes five hours or more By air the journey an be completed in comfort over magnificent scenery in forty minutes. You can read more on “Air Photography”, “New Guinea Gold” and “Over Everest by Air” on this website.